Peppermint herbal leaf. Brew with freshly drawn boiled water that has been allowed to cool for two minutes. Naturally caffeine free, mint tea is considered beneficial for the digestive system. Extremely pleasant after dinner. This is considered a herbal tea. This herbal tea is from Poland. 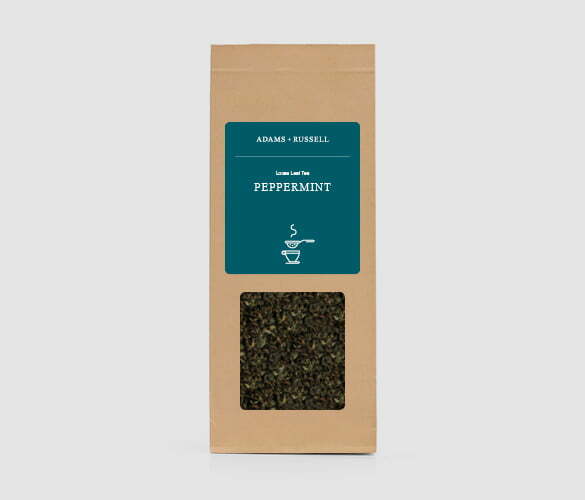 Apart from being delicious, peppermint loose leaf tea brings with it some amazing benefits. But it does also have a few cautionary measures. So below we’re outlining the pros and cons of drinking peppermint tea on a regular basis. In its natural form, peppermint has a very scientific name – Mentha piperita, which is a combination of the words water mint and spearmint. Please note, these are only suggested benefits and therefore our teas are not a replacement for medicinal products. Let us take a look at each of these individually and explain why Peppermint has such great benefits. Reducing fever – When you drink hot tea, it’s likely to cause you to sweat and the menthol in the tea means it helps with fever symptoms. Improving digestion – the tea helps to stimulate gas movement through the body. Preventing nausea – It has significant anti-inflammatory qualities have the ability to reduce queasiness even. Reducing bad breath – this is done through the strong mentholated flavour and anti-bacterial. Helping weight loss – apparently when consumed with a meal, peppermint tea can help you to feel fuller for longer. A good teapot is a necessity to get the most flavour from your leaves. Of course, brewing time is important too. Browse our range of teapots as you can get a 20% discount when you purchase 3 bags of tea. Grab your favourite mug and teapot or tea infuser. Use one teaspoon of leaves for every 4oz of water. Put your leaves into the infuser or teapot and brew with fresh boiling water. Leave for around 3-4 minutes, but you can adjust this depending on how you would like it. Iced peppermint tea is a delicious drink to keep you refreshed and relaxed in warm weather. We have found a couple of great recipes we would like to share with you. The first is from Frugal Farm Wife and is a pretty simple recipe. Stir the peppermint leaves into the boiling water and allow to cool. You can leave them in for just 10 minutes or overnight, depending on how strong you would like the flavour. Strain out the leaves and add your sweetener. Add your cold water, chill and enjoy! This second recipe is from Gourmet Traveller and has a few more steps, but it is definitely worth it. Bring the apple juice to the boil in a pan. Add the tapioca and stir frequently on a high heat for 10-12 minutes. Spread on a tray and allow to cool in the fridge. For the peppermint tea, bring the sugar and 500ml of water to the boil, constantly stirring to dissolve the sugar. Once the sugar is dissolved, remove from the heat and add the peppermint tea leaves. Steep for around 3-4 minutes, or however long you would like depending on what flavour you are after. Strain out the leaves, add 2 cubes of ice and allow to chill in the fridge. Combine the cucumber, apple, lime and juice in a bowl, then stir in the tapioca mixture and mint. Spoon into chilled bowls, top with crushed ice and pour over tea just before serving.